Browse through maps depicting Bay health and restoration, including pollution trends, public access sites and more. 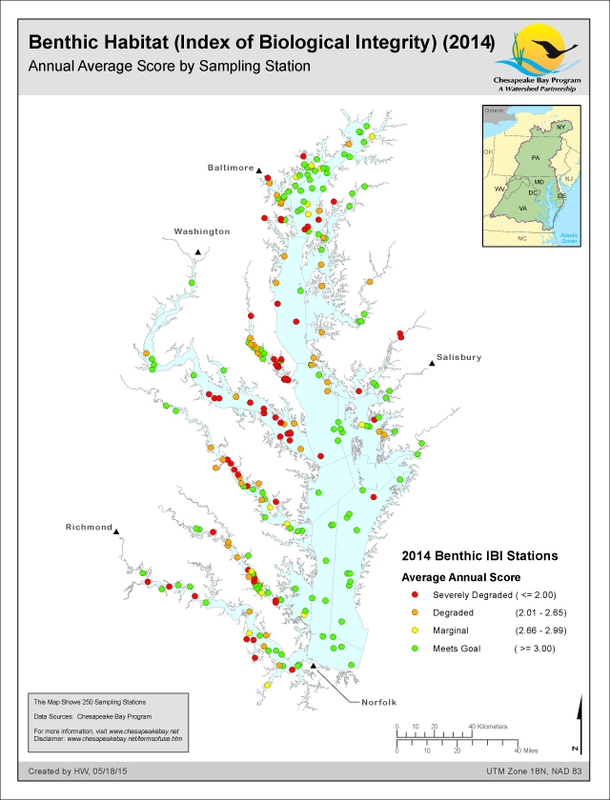 This map shows the 2014 indicator status of the Benthic Index of Biological Integrity by station. 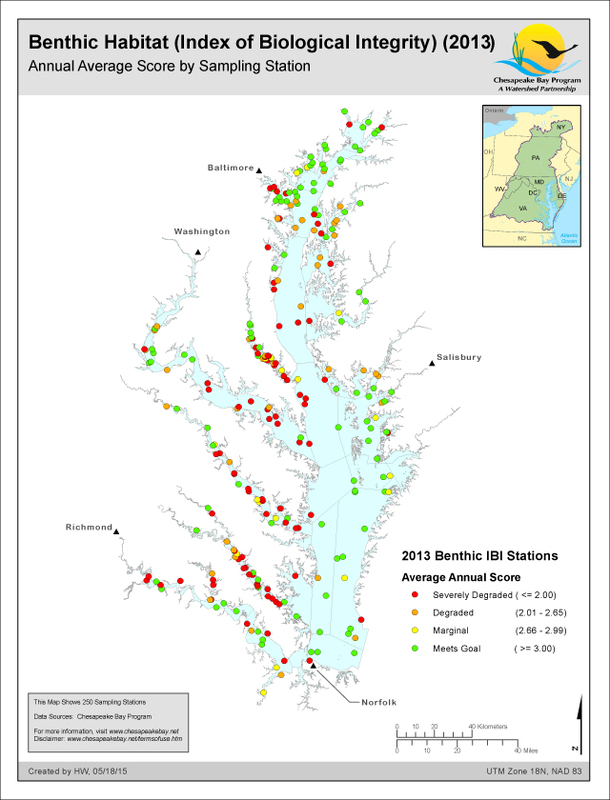 This map shows the 2013 indicator status of the Benthic Index of Biological Integrity by station. This map shows the percent of the Index of Biological Integrity indicator goal achieved by segment. 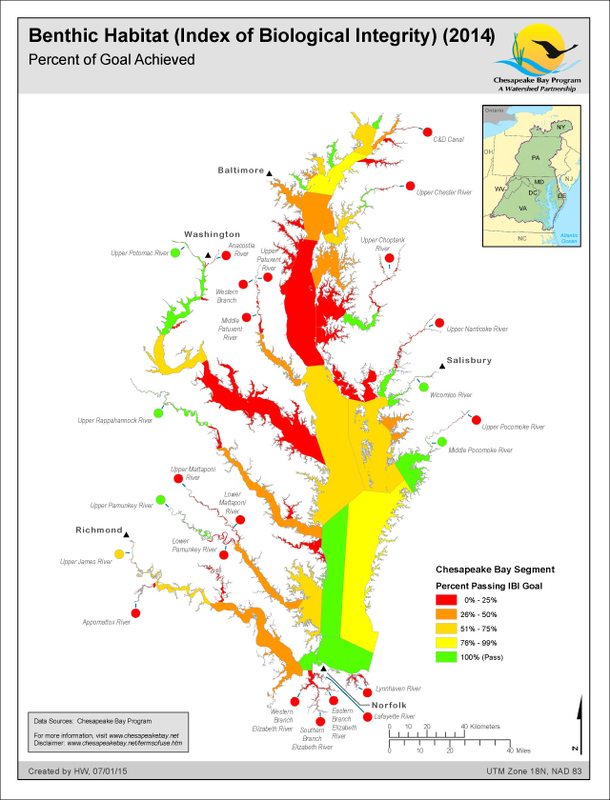 Watershed Yield: Sediment yields ranged from 9.3 to 648 tons per square mile. Each of the 17 sites in the high yield category carries more than 200 tons of sediment per square mile of watershed. 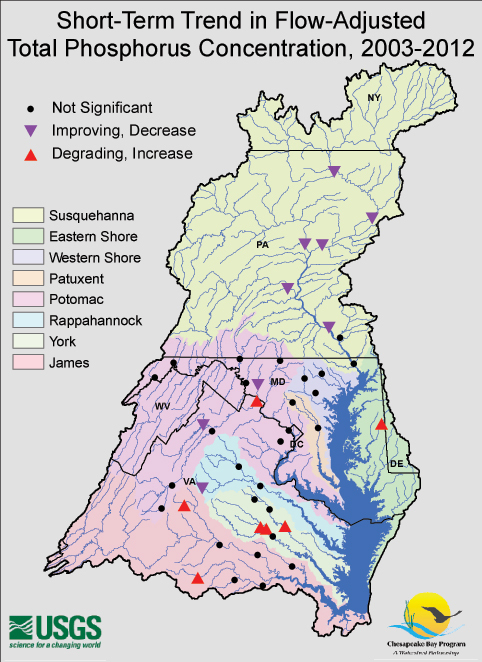 High yielding sites are spatially dispersed across the Susquehanna, Potomac and Rappahannock watersheds. 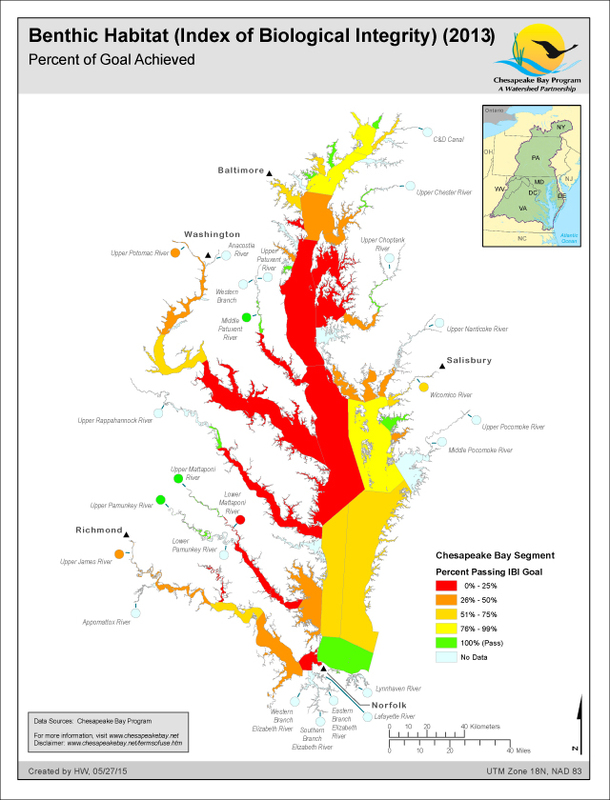 The lowest sediment yielding sits are located on the Eastern Shore and the York River Basin. Watershed Yield: Total Phosphorus yields ranged from 0.036 to 0.57 tons per square mile. Each of the 17 sites in the high yield category carries more than 0.19 tons of phosphorus per square mile of watershed. 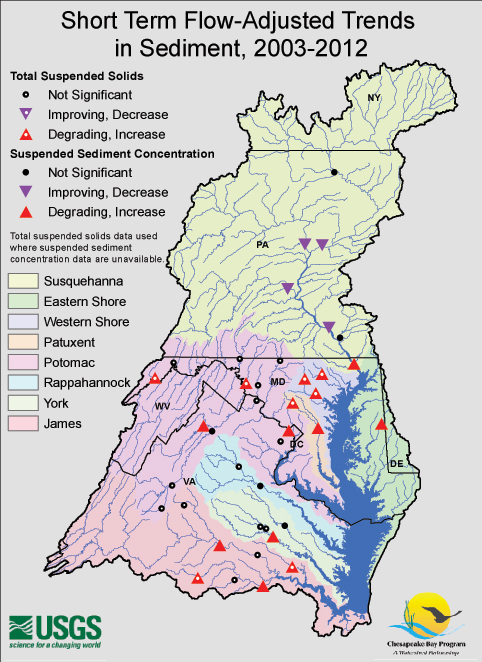 High yielding sites were found in the Eastern Shore, Susquehanna, Potomac, and Rappahannock Watersheds. 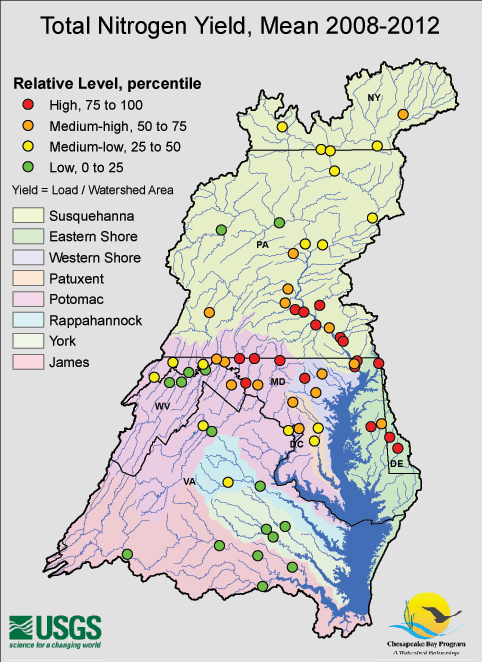 The lowest yields are generally in the western areas of the Bay watershed and the York River Basin. Watershed Yield: Total Nitrogen yields ranged from 0.33 to 9.87 tons per square mile. Each of the 17 sites in the high yield category carries more than 3.4 tons of nitrogen per square mile of watershed. These sites are generally located on the Eastern Shore, Lower Susquehanna and Northern Potomac Watersheds. 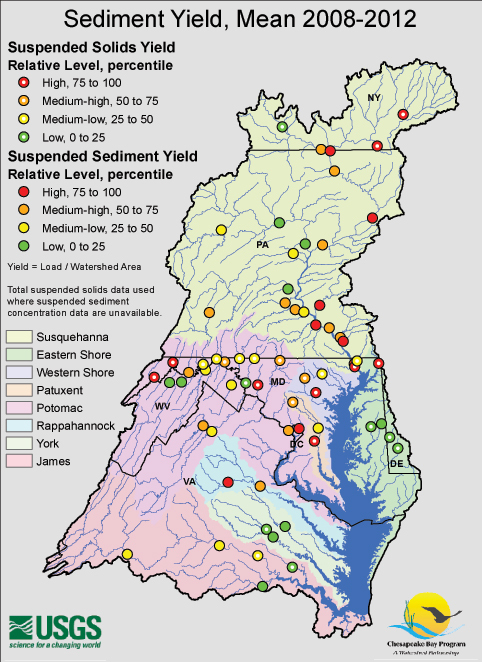 The lowest yields, which are less than 1.2 tons per square mile, are generally in the Upper Potomac and Southern Virginia Rivers. Short Term Trend: Over the past 10 years, 49 percent of sites show little change while 41 percent show degrading flow-adjusted sediment concentrations. Between 2003 and 2012: - 4 out of 39 sites show improving flow-adjusted trends for sediment concentrations, - 16 site shows degrading trends, and - 19 sites show small changes that are not statistically significant. Short Term Trend: Over the past 10 years, 63 percent of the monitoring stations show little or no change in flow-adjusted phosphorus concentrations. Between 2003 and 2012: - 9 out of 43 sites show improving flow-adjusted trends for phosphorus concentrations, - 7 site shows degrading trends, and - 27 sites show small changes that are not statistically significant. Short Term Trend: Over the past 10 years, 54 percent of the monitoring stations show improving flow-adjusted nitrogen concentrations. Only one site showed degrading nitrogen conditions. Between 2003 and 2012: - 25 out of 46 sites show improving flow-adjusted trends for nitrogen concentrations, - 1 site shows degrading trends, and - 20 sites show small changes that are not statistically significant. Find a map using the form below.